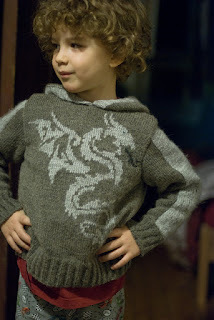 The front for the dragon sweater has intarsia knitting in it. This is my first real experience with this technique, and it's been a little more difficult than I had anticipated. I have started it about 3 times now, and it is much better this time. The biggest thing is having multiple skeins of yarn attached. It makes for a large bundle when knitting, unlike socks. But the effect is great. There is no more pulling or puckering. This is fabulous. I am enjoying it now. Adding more is better in this case. It makes it easier (provided you keep all your strands straight) and the fabric comes out better. It is surprisingly faster as well. Have you tried it yet? I think I may start trying a new technique once a quarter, just to broaden my knowledge base in knitting. I also hope to start the Master Crocheter's course this year. And if things go really well, I may even get to the Master Knitter's course. That would take a miracle though I think. This past year has not been so great, and I am hoping that this next year will be much better. How about you?